Package includes 1 set happy birthday banner with four fishes cards,two brown ribbons and two needles. Perfect choice for kids 1st 2nd 3rd birthday party or any other summer gone fishing theme birthday party. 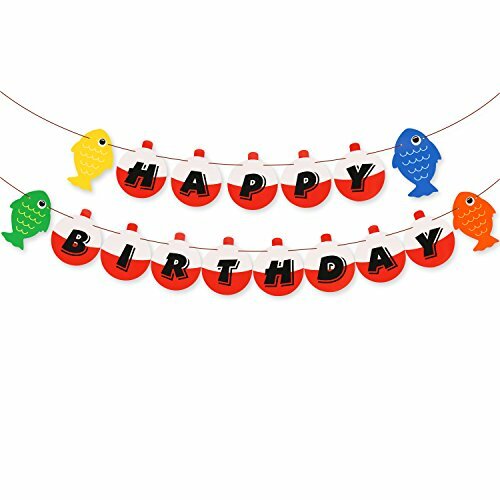 Package includes 1 set fishing party happy birthday banner with four colorful fishes as the picture shown,simple assembly required. Each fish measures 4.5" wide x 6" long. "HAPPY" measures about 3 ft long,and "BIRTHDAY" measures about 5 ft long. Made of colorful unique fishes and bobbers design cards stock,come with two brown color ribbons. Designed by Yaaasssss!Our fast delivery and good quality will make you satisfied. 100% refund service. If you have any questions about this product by Yaaaaasss!, contact us by completing and submitting the form below. If you are looking for a specif part number, please include it with your message.